It's amazing how much waste we generate, just the U.S., more than 250 million tons per year. It takes tremendous resource and energy to process them. If only every household starts to reuse, reduce and recycle! 1. A composter with worms to process vegetable scraps, green wastes, and the paper waste, such as junk mails. Yes, it does work. 2. Mechanical compressor that compresses the aluminium cans, plastic bottles, and other recyclable wastes, so that they are easier to carry and process later. 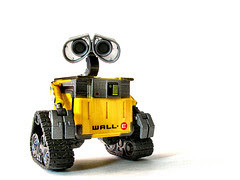 Remember Wall-E's job? 3. A anaerobic digester to convert food waste into extra engery. Well, it does work at scale in Oakland, CA, but may take some time to bring the technology to every home. 4. Dynamic monitor that displays how much carbon footprint you are currently producing, and saving, very much like this one.